One of the city's public pools that will open the first week in June. This is South Pool on Shoshone. I like this one's design, even though it "dates" it. This particular pool didn't open on time last year because of what the city called "stubborn leaks." I like the color and design, it screams summer. I also like the vintage feel of the graphics. Nice shot. Very retro! Hopefully it will open this summer! I was just dreaming of summer, too. I was reading an e-mail from my in-laws who are in the Bahamas for a month. That's a really cool pool entrance. I like the idea of stamping the lettering in the structure to look like a stencil. We are all dreaming of summer, but I can't complain now! :-) Weather is just fantastic, 17ºC today, it was really hot at the beach. Do I see a certain Deco style on the pool building? This brings back memories of the Burnie Olympic Pool of my youth. That is a great retro building. 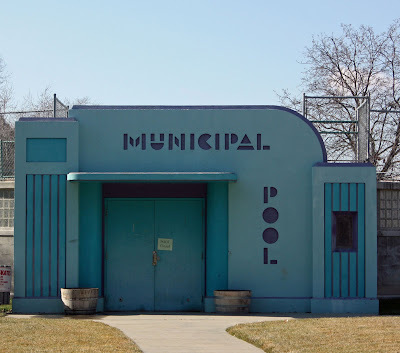 Our pool was closed a few years ago because the building, built in the 1930s, was falling apart. We will hopefully have a new pool, complete with new rec center in the next few years. I will keep my fingers crossed! Yeah!! This pool is literally next door! We love swimming here every evening. I am enjoying your blog very much, seeing Boise through another set of eyes is fun. Here are some links to a couple quick sketches I did of the pool.